Jaipur is indeed a city which is known as the epitome of the royals of India and also is a land where true culture and heritage of India lies.Jaipur is a land of numerous palaces, forts, temples, havelis, chattris, gardens and parks and these are mostly man made wonders. This architecture and royal buildings depicts the royal and rich culture of the Rajput’s and also the Indian history that landed in the sandy state of Rajasthan.The historical Places in Jaipur allure millions of tourists every year from across the world and people love to see the Jaipur heritage. Jaipur is a historical city of Rajasthan which was founded by Sawai Jai Singh II in the 17th century. The Kachwaha Rajputs used to rule the places and various other nearby destinations. During their reign in Jaipur, these rulers have built many historical places in Jaipur and around it, like Amer Fort, City Palace, Gaitore, Hawa Mahal to name a few. Tourists can see every area of the city decorated with palaces and monuments in Jaipur and the city has its rich historicalera for which and has beautiful monuments and forts that depicts the lifestyle of the Maharajas and the Rajput Kings and their martyrdom. Jaipur is considered the most popular destination and the capital city of the state. It has been an important city of Rajasthan since many periods and due to this reason the city, it is scattered with numerous ancient monuments and among them the City Palace, Nahargarh Fort, Rambagh Palace, Jantar Mantar, Amber Fort, Jaigarh Fort, Jal Mahal, and many others. The forts and monuments in Jaipur will narrate you the story of rich past of Jaipur through their inscriptions, architecture, and beautiful paintings. So make sure you visit these places while planning holidays to Jaipur. One of the most important places to visit in Jaipur where the tourists will get astonished to see the beautiful palace of Raja Man Singh’s official residence during the period of 16- 17 th century and the palace is known for its striking Hindu and Muslim architecture. The main sights of the fort are Sheesh Mahal, Rajasthan Kala Mandir etc. Chandra Mahal is a part of the City Palace complex. It is a seven-storeyed building and the floors contain many exclusive paintings, floral decorations, and mirror work on walls. Presently,the palace is the official residence of the king of Jaipur. And the tourist is allowed to see the ground floor where a museum displays carpets, and manuscripts and other objects that belonged to the royals. A must visit tourist places in Jaipur, City Palace is a gorgeous example of Rajput and Mughal architecture and known as the epitome of the Pink City. Built by Maharaja Jai SinghII and the palace complex has other stunning complexes such as Diwan e Khas, Diwan E Aam, Chandra Mahal, Mubarak Mahal and all these are surrounded by lush gardens all over. This is one of the best palaces and monuments of Jaipur and is actually a royal cremation ground for the Kachhwaha Rajput kings and the members of the royal family. The place was founded by Maharaja Sawai Jai Singh II, who was the founder of Jaipur and the building is inspired by exclusive Islamic architecture. Ganesh Pol is a temple dedicated to Lord Ganesh which is located in the Amer Fort which is the one of the most impeccable historical Places in Jaipur, and a prominent mark of Jaipur Heritage. The temple is having an excellent idol of Lord Ganesha and constructed in a traditional Rajput and Islamic architecture. One of the most important things to do in Jaipur is to visit Hawa Mahal. The intricate palace is especially made for the queens and the ladies of the kingdom during the era of Maharaja Sawai Singh. The palace has 950 windows and constructed in the year 1799 in complete red sand stone looking it exquisitely beautiful. This is a huge minaret which is of 60 feet height located in the Tripoli bazaar of Jaipur and the minaret provides a panoramic view of the complete Jaipur City and one can have the best visuals of the city from the minaret. One of the massive Palaces and monuments in Jaipur the Jai Mahal Palace was built in the Indo-Saracenic architecture and the palace is 270 years old. But the palace has been converted into a massive luxurious 5-star hotel which is taken over by Taj Group of Hotels and has been named as one of the lavish hotels of the world. Jaigarh Fort is considered the strongest forts compared to all of other three forts as this fort was mostly executed during the wars. Nestled amidst the rocky and mighty Aravalli ranges and overlooking Amber Fort is also known as “Cheel Ka Teela and inside the palace complex an armory a museum and other complexes such as Laxmi Vilas, Lalit Mandir etc. can be seen. The Jantar Mantar is a structure which is a group of 19 architectural astronomical instruments, made by Raja Sawai Jai Singh, and has the world's largest stone sundial, and stated as UNESCO World Heritage site. It is near City Palace and Hawa Mahal, is also having stonework, stone and brass instruments used for astronomy of ancient Hindu Sanskrit texts. Jantar Mantar is among the most famous tourist attractions in Jaipur. Jantar Mantar Timings : 9:00 AM to 4:30 PM every day. Jantar Mantar Jaipur Entry Fees : Entry fee is Rs. 40 for Indians and Rs. 200 for foreigners. This area is actually a creation ground that was specially built for the royal queens and other ladies who belonged from the royal family. The construction is located near Jal Mahal and known for its beautiful chattris and carved stonework all through the cenotaph. The memorial never opens during the Holi festival. The Moti Doongri Fort used to be the official residence of Maharani Gayatri Devi who was known as one of the most beautiful women of the world. The fort is small but looks a lot like a Scottish Castle and is having a beautiful backdrop of the Birla Temple. Nahargarh Fort is the smallest of all the other three forts and the fort is known for providing the panoramic view of the Man Sagar Lake and the fort is also a nice sight to view the sprawling city of Jaipur and its pastel buildings. A short day trip in Jaipur sightseeing will include it. The sheesh Mahal or the Mirror Palace of Amer Fort is an exquisite place which is completely decorated with mirror works and it can be seen through glass decorated panels and multi-mirrored ceilings all through. 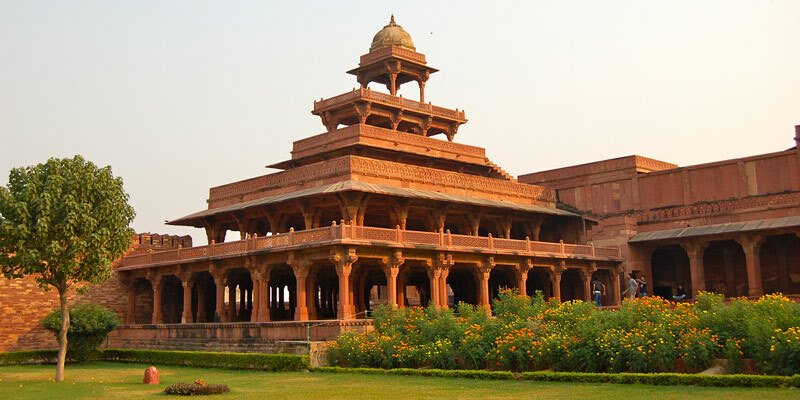 The palace was built by king Man Singh in the 16th century and known for its exclusive beauty. It is one of the most beautiful place to see in Amer Fort.